Christmas time finally seems like it has made its way to our home. We finished packing up all of our packages, letters, and gifts to family and friends. I can't wait to go see my post office friends this afternoon to send all of this Christmas joy out into the world. Daniel decorated the tree this year (I was too tired) and I think he did a fabulous job. I let myself off the hook and only sent Christmas cards to my Aunties and Uncles this year. My favorite part of this morning is that I finished this commissioned sock monkey and I love how it turned out. Now we are off to another appointment where I plan to work on more sock monkeys. Did I mention that we have had one visit to the hospital, two doctors appointments, a dentist appointment, a physical therapy visit and a tour of the maternity ward this week? The only good thing about a week of doctors appointments is that I have been finishing monkeys while waiting in the waiting room. I hope the Christmas spirit has hit in your neck of the woods too. p.s. If you need some help getting into the spirit of things, give this a listen. hugs. 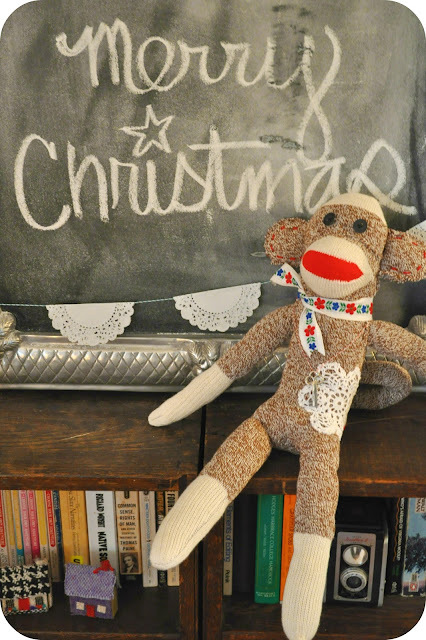 That sock monkey is so, so, SO cute! Good job on the tree, Dan! Looks like there is Christmas cheer in abundance at your place. 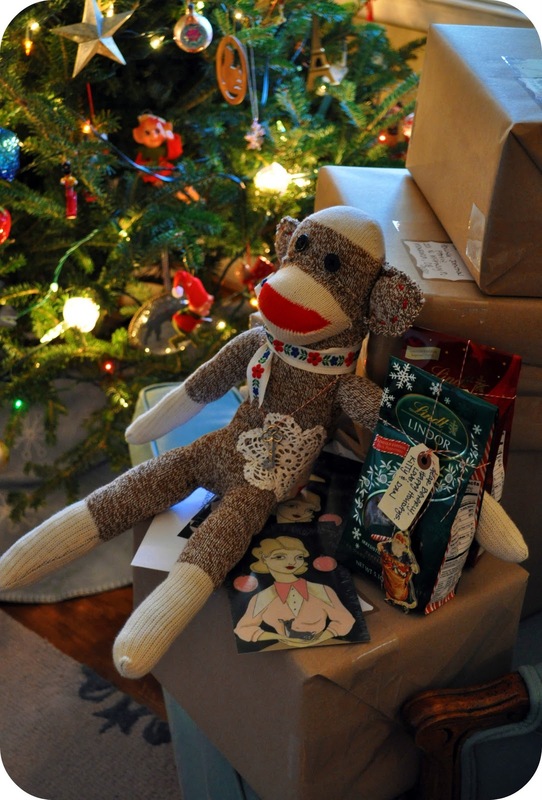 Thank you so much for your sweet comments about this sock monkey. She is on her way to your house. I can't wait for you to give her to your friend. I hope she loves it.